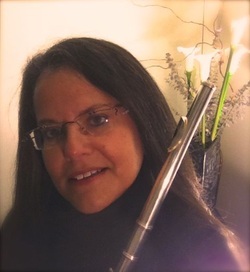 Judy Sammel is an accomplished amateur flutist in the Baltimore area. She's been a member of the Longwood (MA) Symphony Orchestra under the direction of Francisco Noya, the award-winning Rheinhessische Bläserphilharmonie under the direction of Stefan Grefig, and is currently principal flutist of the Baltimore Philharmonia Orchestra under the direction of Rubén Capriles. She's performed on piccolo, flute, alto flute, bass flute, and contrabass flute in the Nashua (NH) Flute Choir, Frederick (MD) Flute Choir, Baltimore Flute Choir, and on tours to France, China, and Turkey as a member of the International Flute Orchestra. She's studied flute with Kathleen Clarke, Robin McKee, Sara Nichols, Karl Strobel, and Lori Kesner, and has performed in masterclasses and workshops with Alexa Still, Gary Schocker, Christine Potter, and Christian Delafontaine. She has performed for several musical theater productions in Maryland and Germany, and was nominated for best instrumentalist in the U.S. Army's European military community in 2002. Other groups she has performed with include the Columbia (MD) Concert Band (including as a soloist), the Columbia Orchestra, and the Herrenberg Stadtorchester. Judy has a B.S. in Mathematics from Towson University, and an M.S. in Computer Science from Johns Hopkins University, and has been a computer scientist with the U.S. Department of Defense for 31 years.